Reanne Evans carried world No 34 Michael Holt to victory in the mixed pairs. Billiards - 14. April 2009. The newly-crowned five-time women’s champion, who won the event last year, was forced to draft in the Hitman as a substitute as her regular partner, Neil Robertson, was suffering from a shoulder injury. 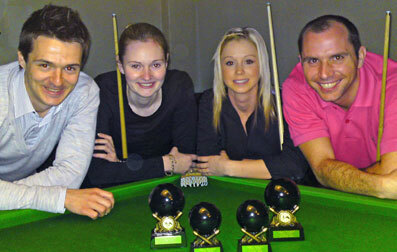 Evans and Holt edged out Leah Willett and Joe Perry 3-2 in the final. World championship semi-finalist Perry posted breaks of 86, 119 and 105 in a 3-0 last-eight victory over Chris and Brian Sharpe. He added a 102 in the semis and a 117 in the final. World No 21 Stuart Bingham, partnering eight-time German national champion Natascha Niermann, compiled a 118 in the second semi. PRELIM: Stacey Hancock & Mark Coles bt Hannah & Mark Jones 3-0. QUARTER-FINALS: Reanne Evans (52) & Michael Holt bt Hancock & Coles 3-0, Natascha Niermann & Stuart Bingham (75) bt Marianne Williams & Kevin Myles 3-1, Sonya Chapman & Matt Couch w/o Maria Catalano & partner, Leah Willett & Joe Perry (86, 119, 105) bt Chris & Brian Sharpe 3-0. SEMI-FINALS: Evans (46, 43, 51) & Holt bt Niermann & Bingham (119) 3-1, Willett & Perry (60, 102) bt Chapman & Couch 3-1. FINAL: Evans & Holt bt Willett & Perry (117, 73) 3-2.